Shipping settings and methods are one of the critical points of every webstore. 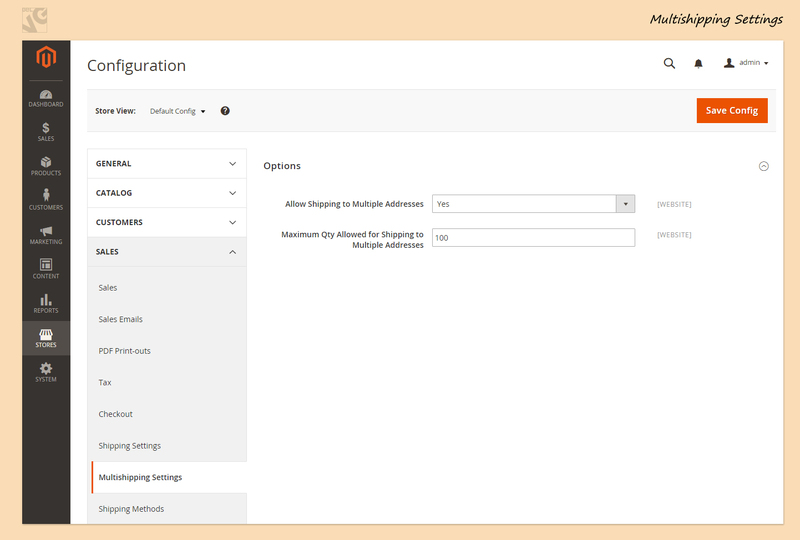 In this article I will show you how you can configure your Shipping settings and methods in Magento 2.0. 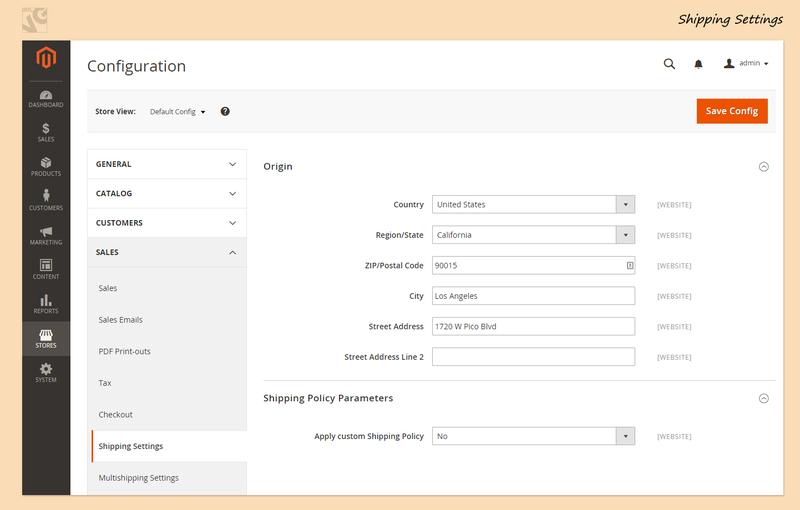 In Shipping Settings you need to indicate the address from which all shipments are made and configure your preferences for shipments to multiple addresses. We indicate the Origin of your deliveries. 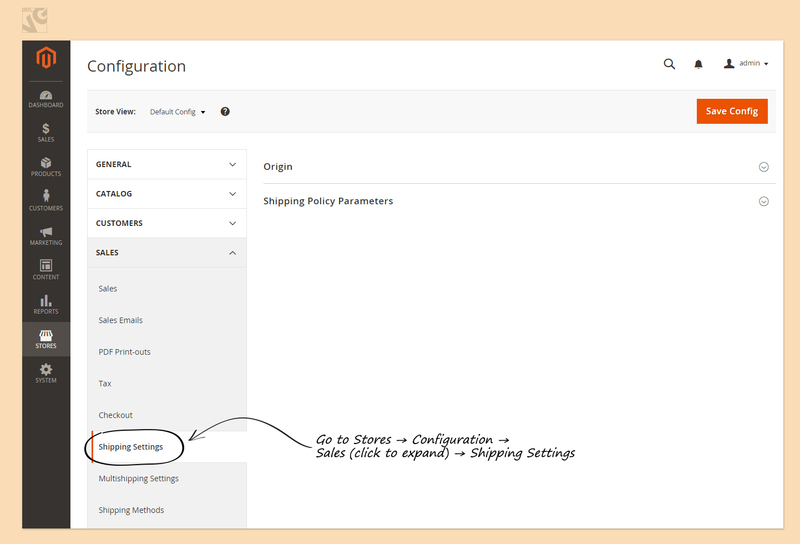 If you want to establish a custom Shipping Policy, you need to select “Yes” in “Apply Custom Shipping Policy” tab. You will have a field where you can write a message to your customers to explain the policy. After these settings are done, you press the Save Config button. Click to expand Options section. If you would like to allow items from a single order to be sent to different destinations, you need to press “yes”. You can limit the number of addresses that can be used in one single order. Let’s say I select “Yes” and limit Maximum quantity to 2. My customer wants to buy a Camera, a Bag and a Table. He wants it to be shipped to 3 different addresses, but he can’t, because we limited the number of addresses in one single order to 2. So he is allowed to only send the Camera to Address A and the Bag to address B, but if he wants to send the Table to address C, he will need to make a separate order. When complete, press the Save Config button. 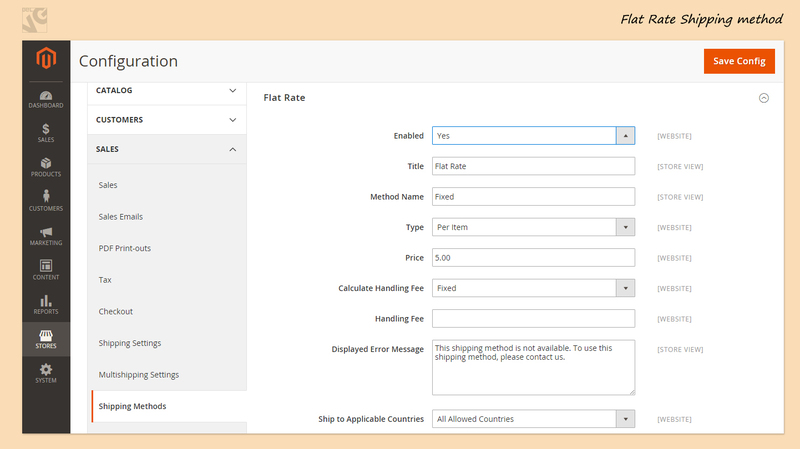 Here you can see all the basic shipping methods in Magento 2.0. Free shipping is considered to be one of the most effective means of promotion. It can be based on a minimum order amount or set up as a shopping price rule and be applied if certain conditions are met. To enable the method, select “Yes” in the first line. You can change the title of the shipping method. You can establish a Minimum Order Amount as a condition that needs to be met to allow Free Shipping. The amount is in your default currency. You can also choose to which countries you allow Free Shipping. By default, all countries are allowed to benefit from Free shipping. Flat Rate is a fixed price of shipping per item or per shipment. This is a simple solution that is especially convenient when your carrier has a flat rate of shipment per package. How to enable Flat Rate? Select “Yes” in the first line. Change Title and Method Name if you want. Select how you want to apply flat rate: per item or per order. Indicate the price that the customer will pay per shipment or per item. You can also establish Handling Fee. This is the compensation for the expenses that are required to handle and/or pack and ship the items. Select you want it to be fixed or percent-based. Indicate your percent or fixed price of handling. Write down the Displayed Error Message. 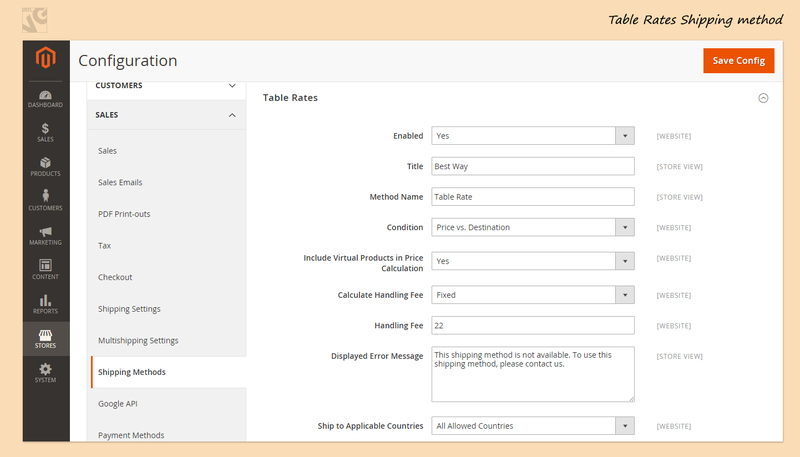 Select Applicable countries to which you allow shipments for which the rate is flat. By default Flat Rate is applicable to all countries. Don’t forget to press the Save Config button. This is a relatively complicated method of shipping price calculation. It can be done in 2 steps. For example, if your shipment’s price depends on Price of order and Destination, then select option 2. After all the default settings are done, don’t forget to press the Save Config button. In the previous versions of Magento there used to be Export CSV button under Condition line. 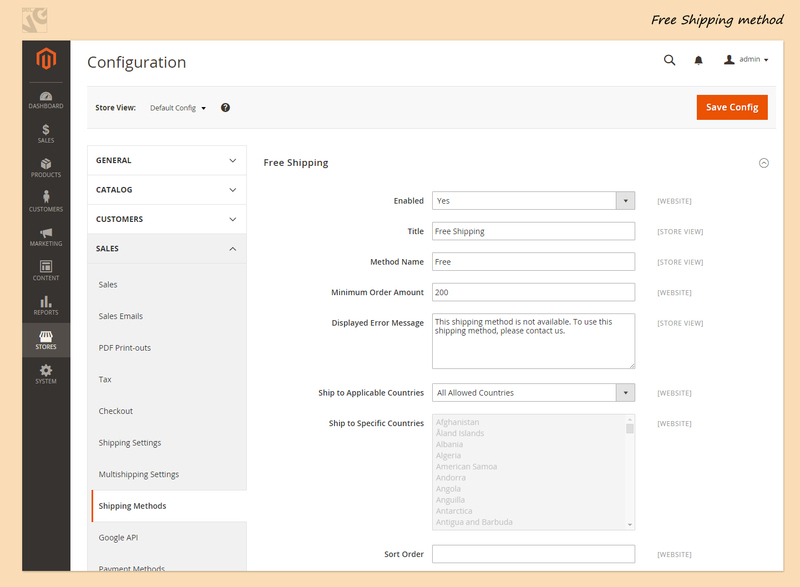 But since we are currently using a demo-version of Magento 2.0, there is no such button yet. Probably, there will be one after the official release. At the moment you can access the file from your FTP manager. You need to edit the file to indicate your prices of shipment to different destinations / for different amounts of orders etc. If you edit the file from FTP, you just save it in UTF-8 format. If you exported it and edited it on your computer, you will need to import the file after. 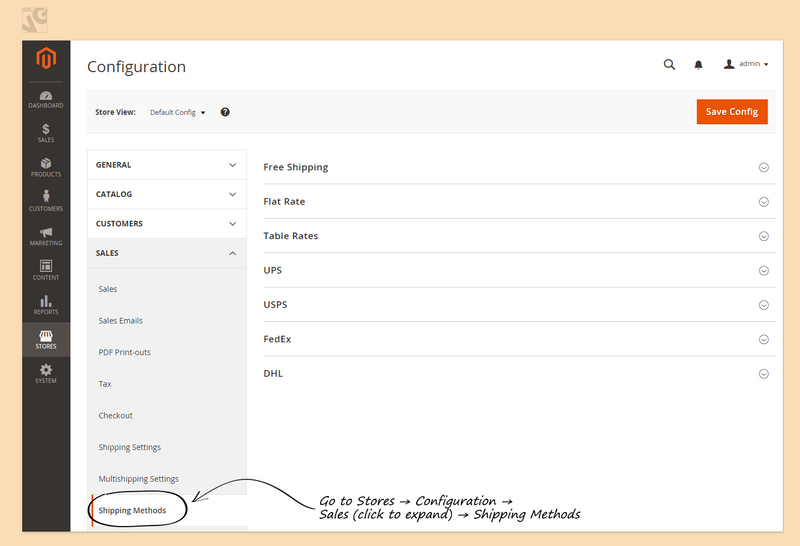 Remember that at the bottom of each Shipping Method’s settings you can find Sort Order field. You can decide in which order the methods will be showed to customers. If you want Free shipping to be placed 3rd after 2 other methods, you need to enter 3 in Free Shipping’s Sort Order and 1 and 2 in 2 other methods. Hope that covers it for the moment. If you have questions, do not hesitate to leave a comment or contact me directly via email andrey@belvg.com.